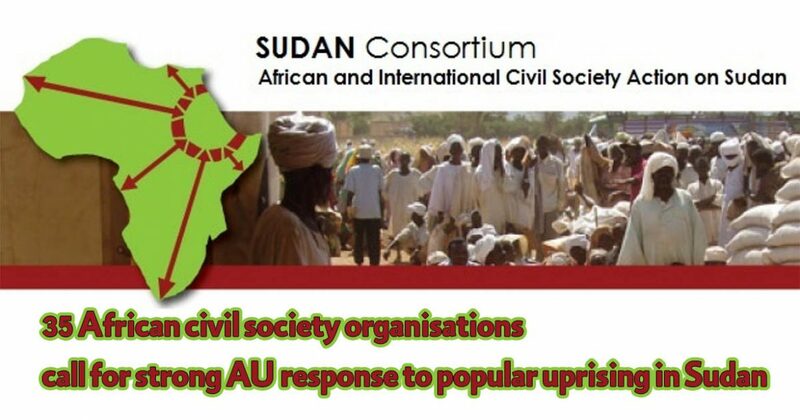 35 African civil society organisations call for strong AU response to popular uprising in Sudan. We, the undersigned African civil society organisations, write with deep concern about the deterioration of the situation in Sudan. The combination of long term repression and economic mismanagement has led to an uprising in which the Sudanese people are calling out for democracy, good governance and human rights, in line with the values of the African Union. Unfortunately, the government of Sudan has responded not by seeking to engage with the concerns of the protesters, but rather by seeking to repress them and to limit their ability to exercise their internationally guaranteed right to freedom of expression. Thousands of Sudanese citizens have been detained, about 50 have been killed and hundreds injured by security apparatus, according to civil society reports. Members of professional associations have been killed. Among the dead are a medical doctor, teacher, students and elders (more details in the background). If urgent action is not taken, it seems likely that violations of the rights of activists and protesters will continue. The AU Peace and Security Council is mandated to promote democratic practices, good governance, the rule of law, protection of human rights and fundamental freedoms and respect for the sanctity of human life. These are the very aspirations being articulated by the Sudanese people. Yet expressions of solidarity from the African Union have not been forthcoming. In other contexts, however, African states have shown that they can act effectively to address emerging crises where the political will is present. For example, the 2017 intervention of the Economic Community of West African States (ECOWAS) in the Gambia which prevented violence from escalating. Given the size, extent and unity of protesters and activists in this uprising, it seems likely unlikely that the status quo can continue. Although precise contours of the change are unclear, there is an urgent need to lay the groundwork for a peaceful and comprehensive transition to ensure that chaos does not take root. This will be particularly critical given Sudan’s significant regional role. With shared borders with seven countries and with a long history of interference with its neighbors, chaos in Sudan would likely have a significant impact on the entire region. Creating an appropriate structure to examine the country’s situation and facilitate inclusive dialogue to agree on a framework for peaceful political transformation and to support it implementation. The African Union has an opportunity to play positive role in this critical moment in Sudan’s history and stand up for the rights of fellow African men and women in Sudan. Over the last six weeks, Sudan has experienced an uprising. Touched off by the removal of subsidies, the current turmoil grows out of deeper crises looming over the country for the past fifteen years in terms of regional conflicts, human rights violations and financial mismanagement. Massive conflicts have raged in Darfur, Blue Nile and Southern Kordofan, disproportionately affecting civilians and causing massive displacement. Despite government protestations of the success of the Doha Document for Peace in Darfur, no sustainable peace has been achieved in any of these conflicts. The Sudanese regime has evidently alienated rule of law institutions and the national army to the extent that it has been forced to rely on party and security mechanisms to preserve the status quo. Despite the fact that Sudan is a signatory to the African Charter on Human and Peoples’ Rights, which guarantees a broad range of rights without discrimination, the country’s human rights record has been consistently poor. Women and religious minorities are particularly vulnerable, with the government adopting an ideology that often legitimises persecution of both groups. This ideology even suffuses school books designed under this regime, seeking to inculcate extremist and exclusionary values to the next generation. The protests began in mid-December, triggered by the removal of subsidies on bread and scarcity of basic commendations including medicine and fuel, but fed by the crises of human rights and conflict that have gripped the country. The scarcity that triggered the protests is not isolated, it is linked to a deep economic crisis. In December 2018, the inflation rate reached 72.94% from the prior year. Although this crisis is driven in part by the loss of South Sudanese oil revenues, it has been exacerbated by government mismanagement. The government has continued to invest massively in military expenditure. Corruption is rampant, Sudan was ranked 175th out of 180 countries reviewed by Transparency International, which also reported that President Bashir and his cronies have likely embezzled up to US$ 9 billion from the oil sector. The country has consistently failed to open up for trade or regional or international collaboration which has contributed to weakening the state’s capacity to manage economic crisis. In this context, there is little sign of a reversal of the country’s economic fortunes in the near future. It is, therefore, unsurprising that protesters have risked the violent crackdown to take to the streets nor that demands quickly escalated from economic concerns to demanding that President Bashir step down. Two weeks into the protests, Sudanese civil society and the political opposition adopted the “Freedom and Change Declaration” calling on Bashir and his government to step down and form a transitional government that can fulfil the aspirations of Sudanese for peace, freedom and democratic transformation. The protests quickly spread nationwide, from Atbara, an area that has traditionally been loyal to Bashir, in the northeast; to Khartoum; to Al Fashir and Buram in Darfur in the west; to Um Ruwaba in North Kordofan and Damazein in Blue Nile. The protests have reached both areas that are under emergency rule and areas that are usually considered to be loyal to the regime. This geographical breadth is greater than in previous rounds of protest that shook the country in 2013, eventually leading to the deaths of at least 185 people according to Amnesty International, and 2018. More people appear to be participating as well, although accurate numbers are difficult to obtain. It is clear that more women, youth groups and young professionals are taking part. Activists are more unified in their demands than they have been in the past. The government has responded with a violent crackdown. The Sudan Professionals Association reports that 52 have been killed to date. There has been particular concern about the reported death in custody of Mr. Mujahid Abdalla, whose family reported that his body showed signs of torture and a bullet wound to the mouth. On 17 January, a medical doctor who was treating wounded protesters was shot in the head after he identified himself as a doctor. On 2 February, a teacher reportedly died in custody. There have been widespread arrests of protesters from the streets and presumed or actual organisers from their homes and offices. The minister of the interior reported to parliament on 7 January that 816 people had been arrested up to that point while a recently leaked memo, whose contents could not be independently verified, indicated that the number is now above 3,000. Although intelligence chief Salah Gosh indicated on 29 January 2019 that those arrested as a result of the protests should be released, civil society partners have confirmed that the activists that they have been following closely have not been released while others reported that only those picked up on the streets were released, while suspected organisers remain in custody. The protesters could certainly have anticipated the government would respond with this sort of violence as they did in 2013. People have taken to the streets nonetheless and stayed for six weeks. Meanwhile, although there have been some expressions of concern from the international community, there has been little forceful action. The international community would appear to prefer the status quo, and to see this as best served by the continuation of Bashir’s reign. However, the intensity of the protests, the repression with which they have been met, alongside the reality of the financial mismanagement and the economic crisis and presence of militias and weapons that touched it off show substantial instability.